McAlpine Gullies > 50mm Shower Trap Gully For Sheet Flooring. 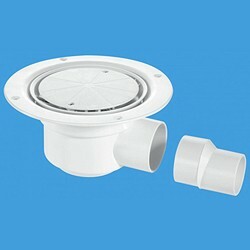 50mm Water seal shower gully and trap in white. Suitable for sheet flooring. White plastic clamp ring, cover plate and securing screws included. Outlet size: 2" x 1 1/2" Socket reducer. McAlpine make the ideal shower gully for all properties, including family homes, domestic wet rooms, student accommodation, bathroom pods, hotels, hospitals and sports and leisure facilities. McAlpine started manufacturing plumbing products in 1902, and in 1957 were the first UK company to make plastic traps. McAlpine now manufacture an exceptionally wide range of products of the highest quality for use in the UK and worldwide.